A Median Auction Stakes over 1m. Good ground. Richard Hannon and the Royal Ascot Racing Club will be quaffing a glass of champagne if Prerogative finds the winner's enclosure today. This son of Rock Of Gibraltar tries for the eighth time of asking after a luckless string of bold shows but no cigar. This bay colt has been admirable in defeat, chasing home a number of talented juveniles. 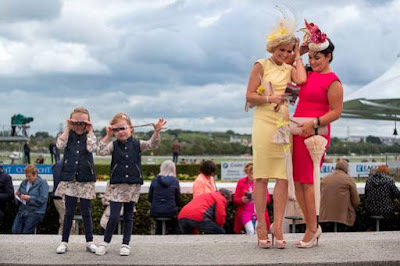 Plenty of horses have won races a lot easier than these hot maidens and his followers will be hoping it is their turn to finally wipe the smile off those dreaded bookmakers. With so many hard races there is a concern this battler may start to sour. In addition, this is his first step up to a mile. This March foal is a consistent horse who deserves his taste of glory and it might just come his way. Joseph Tuite has a well-bred juvenile with the Dark Destroyer who showed up well on debut at Newmarket and then not a million miles away in Goffs Premier Yearling Stakes at York. This step up in distance may bring further improvement because the dam certainly enjoyed a trip at the highest level. A fresh horse, who is likely to be fit for the day, and if there is a chink in Prerogative's armour will enjoy a good joust. Most of the debutantes will have to be pretty smart to unhinge these two protagonists. Andrew Balding can find debut winners, especially when his juveniles are priced 7/1, for some strange reason. Those odds light the tail of his two-year-olds making their racecourse bow. If priced 10/1 & less SP they still have a slightly warm look about them. Aktinson Grimshaw isn't without a chance although the favourites may need to fluff their lines or this chestnut colt needs to be fired-up. Peace Telegram may hold claims if backed to 13/2 & less Sp which is a notable betting guide for Michael Bell's debutants often pointing to their better types in the stable. James Tate is another trainer who does well with two-year-olds at the first time of asking. Saeed Manana does well with his bargain buys and Thomas Crown may be a horse to paint the town red. Verdict: Prerogative deserve to win and may just have enough class to defy this opposition after a number of hard races. I do have a concern when a horse is placed unending times that it may forever struggle to win. Dark Destroyer is a fresher horse and if touching each-way prices would be a worthy opponent. If appreciating this step up in distance, he could be a handful. Definitely, a horse to back if the favourite is supported to the point of stupidity. The debutantes will need to be smart or the favourite disappoint. If Aktinson Grimshaw starts at 7/1 it may be a sign of ability.